Christmas Oratorio, BWV 248, Pt. 2: Cantata for the Second Day of Christmas, No. 12 Chorus "Ehre sei Gott in der Höhe"
Christmas Oratorio, BWV 248, Pt. 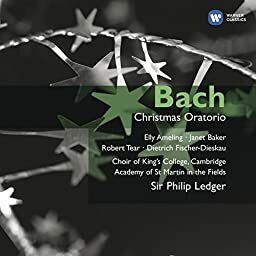 3: Cantata for the Third Day of Christmas, No. 1 Chorus "Herrscher des Himmels, erhöre das Lallen"
Christmas Oratorio, BWV 248, Pt. 3: Cantata for the Third Day of Christmas, No. 3 Chorus "Lasset uns nun gehen gen Bethlehem"
Christmas Oratorio, BWV 248, Pt. 4: Cantata for New Year's Day, No. 1 Chorus "Fallt mit Danken, fallt mit Loben"
Christmas Oratorio, BWV 248, Pt. 6: Cantata for the Feast of Epiphany, No. 1 Chorus "Herr, wenn die stolzen Feinde schnauben"
℗ 1977 The copyright in this sound recording is owned by EMI Records Ltd. Digital remastering 1996 by EMI Records Ltd. © 2008 EMI Records Ltd.